Kevin Hillstrom: MineThatData: Are Discounts And Promotions Ruining E-Commerce? Are Discounts And Promotions Ruining E-Commerce? A quick quiz: If we removed every one of the twenty boxes in the image (click on the image to enlarge it) and all of the potential permutations of the boxes in the image, what would happen to net sales, and earnings before taxes? At the end of the day, the customer still needs to or wants to purchase something. But, with me not going wild on promotions he might be doing it next door? They still are wildy promoting! They're ruining profits, yes, because people are not using control groups and don't understand the organic demand issue that "always on" introduces, as you and I have outlined many times. 1. As alluded to by the poster above: the directive from manic-ment is to "increase sales", not to "increase profits", and until that changes, "the guy next door" is going to override any desire to accurately measure the profitability of campaigns. It takes some real guts to stand there and say "let them take the discounted sale" knowing that you will be better off long run, and this call can only be made way up the ladder, not by the folks executing / measuring campaigns. I have a feeling over the next several years, the "we can make it up on volume" crowd may be forced to look at this issue a bit differently. 2. There is a huge stigma to coming out and saying "we have been analyzing our online camapigns incorrectly for the past X years", as you might imagine. I have suggested to people caught in this place that turnover will fix the problem over the long run, morphing into the line "I can't believe you don't use control groups!" (holdouts) during the interview and first day on the job. My suggestion to these people for their current situation: play around "small" with holdouts / controls so you know how they work and understand the dramatic difference they can make in the financials. So doing, whether the opportunity to play this card comes internally from a manic-ment wake-up call or through leveraging a new job opportunity, they are ready for it! Carry on, our day will come. The more ways we explain this idea to people, the faster people will get it. I will be flogging said horse at the eMetrics Summit in a few weeks. Anonymous, thank you for your comment. You describe something similar to the situation banks were in two years ago --- some chose to hand out mortgages to risky individuals, suggesting that other banks were doing it, so they had to do it. Oooops. Is is cultural, Mr. Novo! I spoke with an EVP of Marketing recently at a company that throws money at consumers. This individual talked about quality merchandise and styling and all the good stuff a person is supposed to say about merchandise. And then, the person said that they "had" to do the promotions to "stay competitive". No testing, just a theory. The person did want to get away from the promotions, the person just didn't want to give up the 15% of sales that would disappear. Oh. I agrree with the other Anonymous but with the caveat of keeping an eye on margins. If I can give up $7 in shipping and make $8 in profit that I may not have gotten without a Free Shipping offer why wouldn't I? It keeps my funnel full and I make the $1 extra. Anonymous 2, there's nothing wrong with that, as long as you can prove the $1 would not have been $8 without the offer. That's what the controls are about, it's the next step after the margin analysis. Anonymous #2 --- I agree and disagree with you. I agree that if it is more profitable to run a promotion than to not run it, then you should run it. But I disagree, then, with your premise. 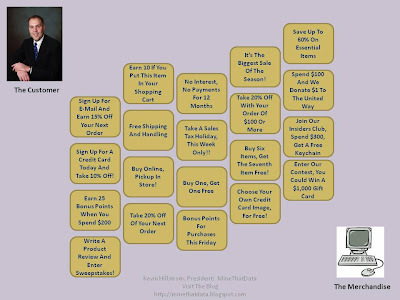 If the discount/promo is more profitable, then why the heck aren't you doing this 24/7/365? Why would you ever stop doing the promotion and become less profitable? Isn't that irresponsible? As Mr. Novo said earlier, long-term tests will tell you whether discounts/promotions ever really add incremental value to the company.